Ooey gooey cheese? Yes please! 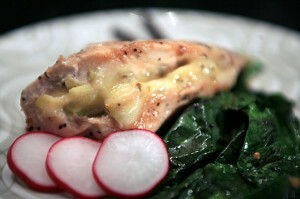 Is there anything more delicious than a juicy chicken breast stuffed with cheese? Yep, add the crunch of apple and hello good looking, come to mama! Watching the scale is easy with recipes like these. This one is a weeknight go-to-recipe for us. We love stuffing chicken with all sorts of surprises; our taste buds love when we come up with different cheese combos. The pepper jack cheese gives a little kick and the sweetness from the apple cools it down. This recipe would also be yummy with brie. Preheat your grill or grill pan on medium heat. Find the thickest part on the side of the chicken breast. Using a knife, create a “pocket”. Move slowly and cut carefully, making sure not to slice all the way through the breast or your fingers. Once you have made your opening, “stuff” each opening of your chicken with 1/2 the sliced apple and 2 oz of the cheese. Use tooth picks to sew back the pocket and create a seal. Season both sides with a dusting of poultry seasoning, salt and pepper. Drizzle with olive oil and grill on medium heat for 7 – 8 minutes on each side. Remember to cook chicken to an internal temperature of 165. This looks really yummy! I might have to try this for dinner! Thanks! I will let you know how it turns out. I made this for dinner tonight and it was very good! I had trouble keeping the apple pieces inside the chicken, but it was still good! Keep the good recipes coming!! !